Because we are whole food vegans, our pantry closet looks like a Bob’s Red Mill outlet since that is where we buy most of our bulk grains, legumes and flours. We always hit up the Portland, Oregon store whenever we venture down that way and slowly cruise the aisles looking at all the amazing organic products they offer. If there is a grain, seed, legume, flour mixture [such as vital wheat gluten or 10-grain mix] that you’ve been hunting for but can’t find locally, check out their web site because they’ll probably have it in stock. I’m really looking forward to ravaging my own pantry as the weather cools and the season turns. I’ll find plenty of uses for dried legumes and grains that’ll help to fend off the cold. This soup is my first autumnal offering. 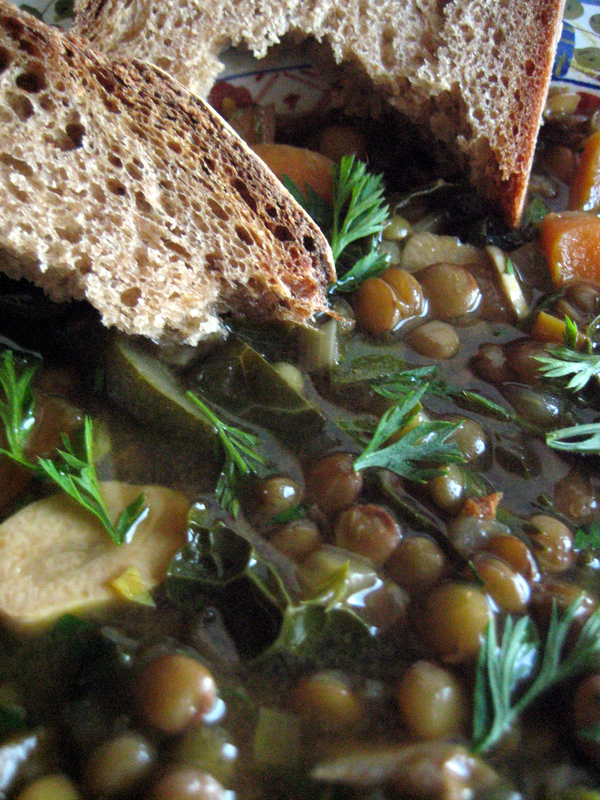 I used two varieties of lentils for this soup for textural reasons. The brown lentils are larger and softer and shall break down with freezing, cooking time or even due to a voracious simmer. The Puy lentils are heartier and will retain their shape through nearly anything. It’s for this reason that I use these little French green lentils most often in recipes unless I specifically want a creamy texture such as in an Indian dal dish. If you don’t have Puy lentils at hand, you may certainly use brown lentils in their place for this recipe. Drizzle a tablespoon or so of olive oil into a soup pot. Add leek, onion, celery, carrot and garlic. Sauté until the vegetables begin to soften. Add the zucchini and lentils and mix well. Add the stock and bring to a slow simmer. Cook for about half an hour to 45 minutes, until the lentils are tender. Season with salt and pepper. Garnish with chopped carrot tops or parsley if no carrot tops were available. 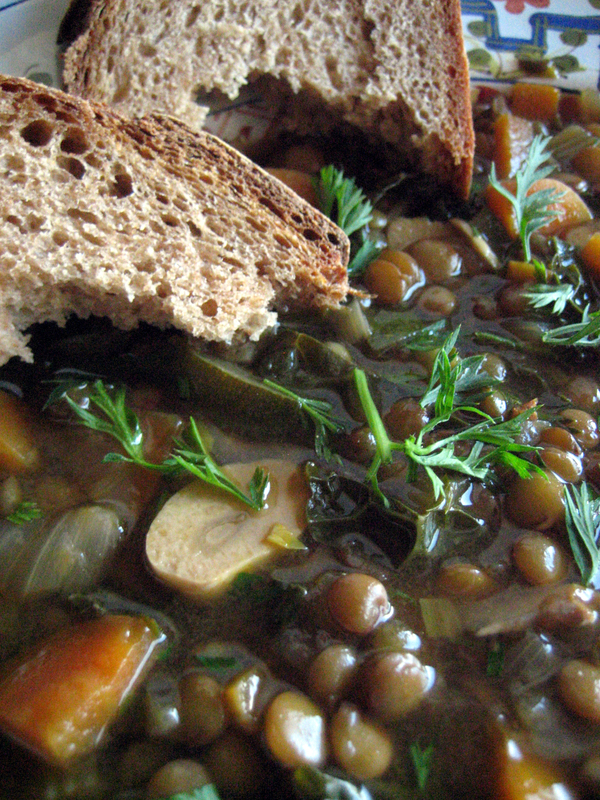 on October 17, 2010 at 7:37 AM | Reply meatless monday recipe: lentil soup… « living in a modern world.